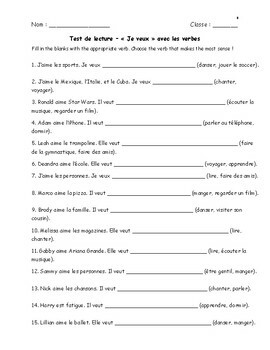 Use this reading assessment to test students knowledge of verbs in French! Included are two versions of the assessment. One has a word bank that students can use to fill in the blanks. The other has provides two verbs in brackets beside each blank to choose from (e.g. Tom aime les sports. Il veut _____ au soccer (jouer, manger). ).